I. A curve has been found representing the frequency distribution of standard deviations of samples drawn from a normal population. IV. Tables are given by which it can be judged whether a series of experiments, however short, have given a result which conforms to any required standard of accuracy or whether it is necessary to continue the investigation. 'The Probable Error of a Mean', Biometrika, 1908, 6, 25. A general course in mathematics should be required of all officers for its practical value, but no less for its educational value in training the mind to logical forms of thought, in developing the sense of absolute truthfulness, together with a confidence in the accomplishment of definite results by definite means. In 'Mathematics at West Point and Annapolis', United States Bureau of Education, Bulletin 1912, No. 2, 11. In Origin of Species (1860), 417. A Miracle is a Violation of the Laws of Nature; and as a firm and unalterable Experience has established these Laws, the Proof against a Miracle, from the very Nature of the Fact, is as entire as any Argument from Experience can possibly be imagined. Why is it more than probable, that all Men must die; that Lead cannot, of itself, remain suspended in the Air; that Fire consumes Wood, and is extinguished by Water; unless it be, that these Events are found agreeable to the Laws of Nature, and there is required a Violation of these Laws, or in other Words, a Miracle to prevent them? Nothing is esteem'd a Miracle, if it ever happen in the common Course of Nature... There must, therefore, be a uniform Experience against every miraculous Event, otherwise the Event would not merit that Appellation. And as a uniform Experience amounts to a Proof, there is here a direct and full Proof, from the Nature of the Fact, against the Existence of any Miracle; nor can such a Proof be destroy'd, or the Miracle render'd credible, but by an opposite Proof, which is superior. An Enquiry Concerning Human Understanding (1748), 180-181. A physician is an unfortunate gentleman who is every day required to perform a miracle; namely to reconcile health with intemperance. In Great Thoughts from Master Minds (1887), 8, 49. A superficial knowledge of mathematics may lead to the belief that this subject can be taught incidentally, and that exercises akin to counting the petals of flowers or the legs of a grasshopper are mathematical. Such work ignores the fundamental idea out of which quantitative reasoning grows—the equality of magnitudes. It leaves the pupil unaware of that relativity which is the essence of mathematical science. Numerical statements are frequently required in the study of natural history, but to repeat these as a drill upon numbers will scarcely lend charm to these studies, and certainly will not result in mathematical knowledge. In Primary Arithmetic: First Year, for the Use of Teachers (1897), 26-27. According to Democritus, atoms had lost the qualities like colour, taste, etc., they only occupied space, but geometrical assertions about atoms were admissible and required no further analysis. In modern physics, atoms lose this last property, they possess geometrical qualities in no higher degree than colour, taste, etc. The atom of modern physics can only be symbolized by a partial differential equation in an abstract multidimensional space. Only the experiment of an observer forces the atom to indicate a position, a colour and a quantity of heat. All the qualities of the atom of modern physics are derived, it has no immediate and direct physical properties at all, i.e. every type of visual conception we might wish to design is, eo ipso, faulty. An understanding of 'the first order' is, I would almost say by definition, impossible for the world of atoms. Philosophic Problems of Nuclear Science, trans. F. C. Hayes (1952), 38. As he [Clifford] spoke he appeared not to be working out a question, but simply telling what he saw. Without any diagram or symbolic aid he described the geometrical conditions on which the solution depended, and they seemed to stand out visibly in space. There were no longer consequences to be deduced, but real and evident facts which only required to be seen. … So whole and complete was his vision that for the time the only strange thing was that anybody should fail to see it in the same way. 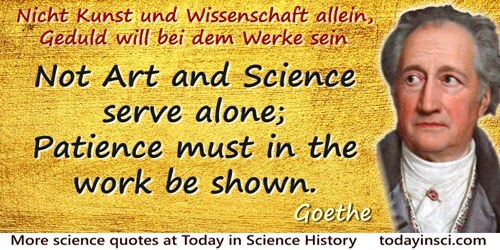 When one endeavored to call it up again, and not till then, it became clear that the magic of genius had been at work, and that the common sight had been raised to that higher perception by the power that makes and transforms ideas, the conquering and masterful quality of the human mind which Goethe called in one word das Dämonische. In Leslie Stephen and Frederick Pollock (eds. ), Lectures and Essays by William Kingdon Clifford(1879), Vol. 1, Introduction, 4-5. At every major step physics has required, and frequently stimulated, the introduction of new mathematical tools and concepts. Our present understanding of the laws of physics, with their extreme precision and universality, is only possible in mathematical terms. In Book Review 'Pulling the Strings,' of Lawrence Krauss's Hiding in the Mirror: The Mysterious Lure of Extra Dimensions, from Plato to String Theory and Beyond in Nature (22 Dec 2005), 438, 1081. But in practical affairs, particularly in politics, men are needed who combine human experience and interest in human relations with a knowledge of science and technology. Moreover, they must be men of action and not contemplation. I have the impression that no method of education can produce people with all the qualities required. I am haunted by the idea that this break in human civilization, caused by the discovery of the scientific method, may be irreparable. My Life & My Views (1968), 57-8. Calculus required continuity, and continuity was supposed to require the infinitely little; but nobody could discover what the infinitely little might be. In 'Recent Work on the Principles of Mathematics The International Monthly (Jul 1901), 4, No. 1, 90. Cells are required to stick precisely to the point. Any ambiguity, any tendency to wander from the matter at hand, will introduce grave hazards for the cells, and even more for the host in which they live. … There is a theory that the process of aging may be due to the cumulative effect of imprecision, a gradual degrading of information. It is not a system that allows for deviating. In 'Information', The Lives of a Cell: Notes of a Biology Watcher (1974), 110-111. Dreams are true interpreters of our inclinations; but there is art required to categorize and understand them. In The Works of Michael de Montaigne (1849), 536. Etna presents us not merely with an image of the power of subterranean heat, but a record also of the vast period of time during which that power has been exerted. A majestic mountain has been produced by volcanic action, yet the time of which the volcanic forms the register, however vast, is found by the geologist to be of inconsiderable amount, even in the modern annals of the earth's history. In like manner, the Falls of Niagara teach us not merely to appreciate the power of moving water, but furnish us at the same time with data for estimating the enormous lapse of ages during which that force has operated. A deep and long ravine has been excavated, and the river has required ages to accomplish the task, yet the same region affords evidence that the sum of these ages is as nothing, and as the work of yesterday, when compared to the antecedent periods, of which there are monuments in the same district. Travels in North America (1845), Vol. 1, 28-9. Fertilization of mammalian eggs is followed by successive cell divisions and progressive differentiation, first into the early embryo and subsequently into all of the cell types that make up the adult animal. Transfer of a single nucleus at a specific stage of development, to an enucleated unfertilized egg, provided an opportunity to investigate whether cellular differentiation to that stage involved irreversible genetic modification. The first offspring to develop from a differentiated cell were born after nuclear transfer from an embryo-derived cell line that had been induced to became quiescent. Using the same procedure, we now report the birth of live lambs from three new cell populations established from adult mammary gland, fetus and embryo. The fact that a lamb was derived from an adult cell confirms that differentiation of that cell did not involve the irreversible modification of genetic material required far development to term. The birth of lambs from differentiated fetal and adult cells also reinforces previous speculation that by inducing donor cells to became quiescent it will be possible to obtain normal development from a wide variety of differentiated cells. In I. Wilmut, A. E. Schnieke, J. McWhir, et al., 'Viable Offspring Derived from Petal and Adult Mammalian Cells', Nature (1997), 385, 810. The Genuine Works of Hippocrates, trans. Francis Adams (1886), Vol. 2, 284. Former arbiters of taste must have felt (as so many apostles of ‘traditional values’ and other highminded tags for restriction and conformity do today) that maintaining the social order required a concept of unalloyed heroism. Human beings so designated as role models had to embody all virtues of the paragon–which meant, of course, that they could not be described in their truly human and ineluctably faulted form. Houston, that may have seemed like a very long final phase. The autotargeting was taking us right into a... crater, with a large number of big boulders and rocks ... and it required... flying manually over the rock field to find a reasonably good area. In speech, 'Education for Creativity in the Sciences', Conference at New York University, Washington Square. As quoted by Gene Currivan in 'I.Q. Tests Called Harmful to Pupil', New York Times (16 Jun 1963), 66. I am particularly concerned to determine the probability of causes and results, as exhibited in events that occur in large numbers, and to investigate the laws according to which that probability approaches a limit in proportion to the repetition of events. That investigation deserves the attention of mathematicians because of the analysis required. It is primarily there that the approximation of formulas that are functions of large numbers has its most important applications. The investigation will benefit observers in identifying the mean to be chosen among the results of their observations and the probability of the errors still to be apprehended. Lastly, the investigation is one that deserves the attention of philosophers in showing how in the final analysis there is a regularity underlying the very things that seem to us to pertain entirely to chance, and in unveiling the hidden but constant causes on which that regularity depends. It is on the regularity of the main outcomes of events taken in large numbers that various institutions depend, such as annuities, tontines, and insurance policies. Questions about those subjects, as well as about inoculation with vaccine and decisions of electoral assemblies, present no further difficulty in the light of my theory. I limit myself here to resolving the most general of them, but the importance of these concerns in civil life, the moral considerations that complicate them, and the voluminous data that they presuppose require a separate work. Philosophical Essay on Probabilities (1825), trans. Andrew I. Dale (1995), Introduction. I believe as a matter of faith that the extension of space travel to the limits of the solar system will probably be accomplished in several decades, perhaps before the end of the century. Pluto is 4000 million miles from the sun. The required minimum launching velocity is about 10 miles per second and the transit time is 46 years. Thus we would have to make the velocity considerably higher to make the trip interesting to man. Travel to the stars is dependent on radically new discoveries in science and technology. The nearest star is 25 million million miles way and requires a travel time of more than four years at the speed of light. Prof. Dr. Ing. E. Sanger has speculated that velocities comparable with the speed of light might be attained in the next century, but such extrapolation of current technology is probably not very reliable. In Popular Mechanics (Sep 1961), 262. I believed that, instead of the multiplicity of rules that comprise logic, I would have enough in the following four, as long as I made a firm and steadfast resolution never to fail to observe them. The first was never to accept anything as true if I did not know clearly that it was so; that is, carefully to avoid prejudice and jumping to conclusions, and to include nothing in my judgments apart from whatever appeared so clearly and distinctly to my mind that I had no opportunity to cast doubt upon it. The second was to subdivide each on the problems I was about to examine: into as many parts as would be possible and necessary to resolve them better. The third was to guide my thoughts in an orderly way by beginning, as if by steps, to knowledge of the most complex, and even by assuming an order of the most complex, and even by assuming an order among objects in! cases where there is no natural order among them. And the final rule was: in all cases, to make such comprehensive enumerations and such general review that I was certain not to omit anything. The long chains of inferences, all of them simple and easy, that geometers normally use to construct their most difficult demonstrations had given me an opportunity to think that all the things that can fall within the scope of human knowledge follow from each other in a similar way, and as long as one avoids accepting something as true which is not so, and as long as one always observes the order required to deduce them from each other, there cannot be anything so remote that it cannot be reached nor anything so hidden that it cannot be uncovered. Discourse on Method in Discourse on Method and Related Writings (1637), trans. Desmond M. Clarke, Penguin edition (1999), Part 2, 16. I had made up my mind to find that for which I was searching even if it required the remainder of my life. After innumerable failures I finally uncovered the principle for which I was searching, and I was astounded at its simplicity. I was still more astounded to discover the principle I had revealed not only beneficial in the construction of a mechanical hearing aid but it served as well as means of sending the sound of the voice over a wire. Another discovery which came out of my investigation was the fact that when a man gives his order to produce a definite result and stands by that order it seems to have the effect of giving him what might be termed a second sight which enables him to see right through ordinary problems. What this power is I cannot say; all I know is that it exists and it becomes available only when a man is in that state of mind in which he knows exactly what he wants and is fully determined not to quit until he finds it. As quoted, without citation, in Mack R. Douglas, Making a Habit of Success: How to Make a Habit of Succeeding, How to Win With High Self-Esteem (1966, 1994), 38. Note: Webmaster is dubious of a quote which seems to appear in only one source, without a citation, decades after Bell’s death. If you know a primary source, please contact Webmaster. I shall consider this paper an essay in geopoetry. In order not to travel any further into the realm of fantasy than is absolutely necessary I shall hold as closely as possibly to a uniformitarian approach; even so, at least one great catastrophe will be required early in the Earth's history. 'History of Ocean Basins', in A. E. J. Engel, H. L. James and B. F. Leonard (eds. ), Petrologic Studies: A Volume to Honour F. Buddington (1962), 599-600. I, however, believe that for the ripening of experience the light of an intelligent theory is required. People are amused by the witticism that the man with a theory forces from nature that answer to his question which he wishes to have but nature never answers unless she is questioned, or to speak more accurately, she is always talking to us and with a thousand tongues but we only catch the answer to our own question. Quoted in Major Greenwood, Epidemiology Historical and Experimental. The Herter Lectures for 1931 (1932), 13. If I had my way every French boy would be required to take a trip to America as part of his education. As quoted by H.M. Davidson, in System: The Magazine of Business (Apr 1922), 41, 446. If, then, the motion of every particle of matter in the universe were precisely reversed at any instant, the course of nature would be simply reversed for ever after. The bursting bubble of foam at the foot of a waterfall would reunite and descend into the water; the thermal motions would reconcentrate their energy, and throw the mass up the fall in drops re-forming into a close column of ascending water. Heat which had been generated by the friction of solids and dissipated by conduction, and radiation, and radiation with absorption, would come again to the place of contact, and throw the moving body back against the force to which it had previously yielded. Boulders would recover from the mud materials required to rebuild them into their previous jagged forms, and would become reunited to the mountain peak from which they had formerly broken away. And if also the materialistic hypothesis of life were true, living creatures would grow backwards, with conscious knowledge of the future but no memory of the past, and would become again unborn. In 'The Kinetic Theory of the Dissipation of Energy', Nature (1874), 9, 442. In a class I was taking there was one boy who was much older than the rest. He clearly had no motive to work. I told him that, if he could produce for me, accurately to scale, drawings of the pieces of wood required to make a desk like the one he was sitting at, I would try to persuade the Headmaster to let him do woodwork during the mathematics hours—in the course of which, no doubt, he would learn something about measurement and numbers. Next day, he turned up with this task completed to perfection. This I have often found with pupils; it is not so much that they cannot do the work, as that they see no purpose in it. In Mathematician's Delight (1943), 52. In no subject is there a rule, compliance with which will lead to new knowledge or better understanding. Skilful observations, ingenious ideas, cunning tricks, daring suggestions, laborious calculations, all these may be required to advance a subject. Occasionally the conventional approach in a subject has to be studiously followed; on other occasions it has to be ruthlessly disregarded. Which of these methods, or in what order they should be employed is generally unpredictable. Analogies drawn from the history of science are frequently claimed to be a guide; but, as with forecasting the next game of roulette, the existence of the best analogy to the present is no guide whatever to the future. The most valuable lesson to be learnt from the history of scientific progress is how misleading and strangling such analogies have been, and how success has come to those who ignored them. 'Cosmology', in Arthur Beer (ed. ), Vistas in Astronomy (1956), Vol. 2, 1722. In the discovery of lemmas the best aid is a mental aptitude for it. For we may see many who are quick at solutions and yet do not work by method ; thus Cratistus in our time was able to obtain the required result from first principles, and those the fewest possible, but it was his natural gift which helped him to the discovery. As given in Euclid, The Thirteen Books of Euclid's Elements, translated from the text of Johan Ludvig Heiberg by Sir Thomas Little Heath, Vol. 1, Introduction and Books 1,2 (1908), 133. The passage also states that Proclus gives the definition of the term lemma as a proposition not proved beforehand. Glenn Raymond Morrow in A Commentary on the First Book of Euclid's Elements (1992), 165, states nothing more seems to be known of Cratistus. In the same sense that our judicial system presumes us to be innocent until proven guilty, a medical care system may work best if it starts with the presumption that most people are healthy. Left to themselves, computers may try to do it in the opposite way, taking it as given that some sort of direct, continual, professional intervention is required all the time, in order to maintain the health of each citizen, and we will end up spending all our money on nothing but this. In 'Aspects of Biomedical Science Policy', The New England Journal of Medicine (12 Oct 1972), 4. Also published as Occasional Paper of the Institute of Medicine. It has been said that no science is established on a firm basis unless its generalisations can be expressed in terms of number, and it is the special province of mathematics to assist the investigator in finding numerical relations between phenomena. After experiment, then mathematics. While a science is in the experimental or observational stage, there is little scope for discerning numerical relations. It is only after the different workers have “collected data” that the mathematician is able to deduce the required generalisation. Thus a Maxwell followed Faraday and a Newton completed Kepler. In Higher Mathematics for Students of Chemistry and Physics (1902), 3. It is curious to observe how differently these great men [Plato and Bacon] estimated the value of every kind of knowledge. Take Arithmetic for example. Plato, after speaking slightly of the convenience of being able to reckon and compute in the ordinary transactions of life, passes to what he considers as a far more important advantage. The study of the properties of numbers, he tells us, habituates the mind to the contemplation of pure truth, and raises us above the material universe. He would have his disciples apply themselves to this study, not that they may be able to buy or sell, not that they may qualify themselves to be shop-keepers or travelling merchants, but that they may learn to withdraw their minds from the ever-shifting spectacle of this visible and tangible world, and to fix them on the immutable essences of things. Bacon, on the other hand, valued this branch of knowledge only on account of its uses with reference to that visible and tangible world which Plato so much despised. He speaks with scorn of the mystical arithmetic of the later Platonists, and laments the propensity of mankind to employ, on mere matters of curiosity, powers the whole exertion of which is required for purposes of solid advantage. He advises arithmeticians to leave these trifles, and employ themselves in framing convenient expressions which may be of use in physical researches. In 'Lord Bacon', Edinburgh Review (Jul 1837). Collected in Critical and Miscellaneous Essays: Contributed to the Edinburgh Review (1857), Vol. 1, 394. It is not possible to find in all geometry more difficult and more intricate questions or more simple and lucid explanations [than those given by Archimedes]. Some ascribe this to his natural genius; while others think that incredible effort and toil produced these, to all appearance, easy and unlaboured results. No amount of investigation of yours would succeed in attaining the proof, and yet, once seen, you immediately believe you would have discovered it; by so smooth and so rapid a path he leads you to the conclusion required. It is not surprising, in view of the polydynamic constitution of the genuinely mathematical mind, that many of the major heros of the science, men like Desargues and Pascal, Descartes and Leibnitz, Newton, Gauss and Bolzano, Helmholtz and Clifford, Riemann and Salmon and Plücker and Poincaré, have attained to high distinction in other fields not only of science but of philosophy and letters too. And when we reflect that the very greatest mathematical achievements have been due, not alone to the peering, microscopic, histologic vision of men like Weierstrass, illuminating the hidden recesses, the minute and intimate structure of logical reality, but to the larger vision also of men like Klein who survey the kingdoms of geometry and analysis for the endless variety of things that flourish there, as the eye of Darwin ranged over the flora and fauna of the world, or as a commercial monarch contemplates its industry, or as a statesman beholds an empire; when we reflect not only that the Calculus of Probability is a creation of mathematics but that the master mathematician is constantly required to exercise judgment—judgment, that is, in matters not admitting of certainty—balancing probabilities not yet reduced nor even reducible perhaps to calculation; when we reflect that he is called upon to exercise a function analogous to that of the comparative anatomist like Cuvier, comparing theories and doctrines of every degree of similarity and dissimilarity of structure; when, finally, we reflect that he seldom deals with a single idea at a tune, but is for the most part engaged in wielding organized hosts of them, as a general wields at once the division of an army or as a great civil administrator directs from his central office diverse and scattered but related groups of interests and operations; then, I say, the current opinion that devotion to mathematics unfits the devotee for practical affairs should be known for false on a priori grounds. And one should be thus prepared to find that as a fact Gaspard Monge, creator of descriptive geometry, author of the classic Applications de l’analyse à la géométrie; Lazare Carnot, author of the celebrated works, Géométrie de position, and Réflections sur la Métaphysique du Calcul infinitesimal; Fourier, immortal creator of the Théorie analytique de la chaleur; Arago, rightful inheritor of Monge’s chair of geometry; Poncelet, creator of pure projective geometry; one should not be surprised, I say, to find that these and other mathematicians in a land sagacious enough to invoke their aid, rendered, alike in peace and in war, eminent public service. In Lectures on Science, Philosophy and Art (1908), 32-33. It is not, indeed, strange that the Greeks and Romans should not have carried ... any ... experimental science, so far as it has been carried in our time; for the experimental sciences are generally in a state of progression. They were better understood in the seventeenth century than in the sixteenth, and in the eighteenth century than in the seventeenth. But this constant improvement, this natural growth of knowledge, will not altogether account for the immense superiority of the modern writers. The difference is a difference not in degree, but of kind. It is not merely that new principles have been discovered, but that new faculties seem to be exerted. It is not that at one time the human intellect should have made but small progress, and at another time have advanced far; but that at one time it should have been stationary, and at another time constantly proceeding. In taste and imagination, in the graces of style, in the arts of persuasion, in the magnificence of public works, the ancients were at least our equals. They reasoned as justly as ourselves on subjects which required pure demonstration. History (May 1828). In Samuel Austin Allibone, Prose Quotations from Socrates to Macaulay (1880), 36. It might be going too far to say that the modern scientific movement was tainted from its birth; but I think it would be true to say that it was born in an unhealthy neighborhood and at an inauspicious hour. Its triumphs may have been too rapid and purchased at too high a price: reconsideration, and something like repentance, may be required. In The Abolition of Man (1978). It required unusual inquisitiveness to pursue the development of scientific curiosities such as charged pith balls, the voltaic cell, and the electrostatic machine. Without such endeavors and the evolution of associated instrumentation, initially of purely scientific interest, most of the investigations that lead to the basic equations of electromagnetism would have been missed. … We would have been deprived of electromagnetic machinery as well as knowledge of electromagnetic waves. From The Science Matrix: The Journey, Travails, Triumphs (1992, 1998), 14. John Dalton was a very singular Man, a quaker by profession & practice: He has none of the manners or ways of the world. A tolerable mathematician He gained his livelihood I believe by teaching the mathematics to young people. He pursued science always with mathematical views. He seemed little attentive to the labours of men except when they countenanced or confirmed his own ideas... He was a very disinterested man, seemed to have no ambition beyond that of being thought a good Philosopher. He was a very coarse Experimenter & almost always found the results he required.—Memory & observation were subordinate qualities in his mind. He followed with ardour analogies & inductions & however his claims to originality may admit of question I have no doubt that he was one of the most original philosophers of his time & one of the most ingenious. J. Z. Fullmer, 'Davy's Sketches of his Contemporaries', Chymia, 1967, 12, 133-134. Knowledge is a matter of science, and no dishonesty or conceit whatsoever is permissible. What is required is definitely the reverse—honesty and modesty. In Quotations from Chairman Mao Tsetung (1966, 1972), 310. Mankind lies groaning, half-crushed beneath the weight of its own progress. Men do not sufficiently realize that their future is in their own hands. Theirs is the task of determining first of all whether they want to go on living or not. Theirs the responsibility, then, for deciding if they want merely to live, or intend to make just the extra effort required for fulfilling, even on their refractory planet, the essential function of the universe, which is a machine for the making of gods. The Two Sources of Morality and Religion, trans. by R. Ashley Audra and Cloudesley Brereton (1935), 275. Mathematical reasoning is deductive in the sense that it is based upon definitions which, as far as the validity of the reasoning is concerned (apart from any existential import), needs only the test of self-consistency. Thus no external verification of definitions is required in mathematics, as long as it is considered merely as mathematics. In Universal Algebra (1898), Preface, vi. Mathematics … belongs to every inquiry, moral as well as physical. Even the rules of logic, by which it is rigidly bound, could not be deduced without its aid. The laws of argument admit of simple statement, but they must be curiously transposed before they can be applied to the living speech and verified by observation. In its pure and simple form the syllogism cannot be directly compared with all experience, or it would not have required an Aristotle to discover it. It must be transmuted into all the possible shapes in which reasoning loves to clothe itself. The transmutation is the mathematical process in the establishment of the law. From Memoir (1870) read before the National Academy of Sciences, Washington, printed in 'Linear Associative Algebra', American Journal of Mathematics (1881), 4, 97-98. Models so constructed, though of no practical value, serve a useful academic function. The oldest problem in economic education is how to exclude the incompetent. The requirement that there be an ability to master difficult models, including ones for which mathematical competence is required, is a highly useful screening device. In Economics, Peace, and Laughter (1981), 40-41. Now it came to me: … the independence of the gravitational acceleration from the nature of the falling substance, may be expressed as follows: In a gravitational field (of small spatial extension) things behave as they do in a space free of gravitation. … This happened in 1908. Why were another seven years required for the construction of the general theory of relativity? The main reason lies in the fact that it is not so easy to free oneself from the idea that coordinates must have an immediate metrical meaning. In Paul Arthur Schilpp, 'Autobiographical Notes', Albert Einstein: Philosopher-Scientist (1949), 65-67. In 'Can Rocket Stations Give Worldwide Coverage? ', Wireless World (Oct 1945). Quoted and cited in Arthur C. Clarke, Greetings, Carbon-Based Bipeds! : Collected Essays, 1934-1998, 22. Only six electronic digital computers would be required to satisfy the computing needs of the entire United States. (1947). As quoted, without citation, as an epigraph in Jeremy M. Norman, From Gutenberg to the Internet: A Sourcebook on the History of Information Technology (2007), Vol. 2, 3. Order is not sufficient. What is required, is something much more complex. It is order entering upon novelty; so that the massiveness of order does not degenerate into mere repetition; and so that the novelty is always reflected upon a background of system. Alfred North Whitehead, David Ray Griffin (ed. ), Donald W. Sherburne (ed. ), Process and Reality: an Essay in Cosmology (2nd Ed.,1979), 339. Plants, again, inasmuch as they are without locomotion, present no great variety in their heterogeneous pacts. For, when the functions are but few, few also are the organs required to effect them. ... Animals, however, that not only live but perceive, present a great multiformity of pacts, and this diversity is greater in some animals than in others, being most varied in those to whose share has fallen not mere life but life of high degree. Now such an animal is man. Parts of Animals, 655b, 37-656a, 7. In Jonathan Barnes (ed. ), The Complete Works of Aristotle (1984), Vol. I, 1021-2. Reagents are regarded as acting by virtue of a constitutional affinity either for electrons or for nuclei... the terms electrophilic (electron-seeking) and nucleophilic (nucleus-seeking) are suggested... and the organic molecule, in the activation necessary for reaction, is therefore required to develop at the seat of attack either a high or low electron density as the case may be. 'Significance of Tautomerism and of the Reactions of Aromatic Compounds in the Electronic Theory of Organic Relations', Journal of the Chemical Society (1933), 136, 1121, fn. Since the Creator had made the facts of the after-life inaccessible to man, He must not have required that man understand death in order to live fruitfully. In The Lost World of Thomas Jefferson (1948, 1993), 262. Sir Hiram Maxim is a genuine and typical example of the man of science, romantic, excitable, full of real but somewhat obvious poetry, a little hazy in logic and philosophy, but full of hearty enthusiasm and an honorable simplicity. He is, as he expresses it, “an old and trained engineer,” and is like all of the old and trained engineers I have happened to come across, a man who indemnifies himself for the superhuman or inhuman concentration required for physical science by a vague and dangerous romanticism about everything else. In G.K. Chesterton, 'The Maxims of Maxim', Daily News (25 Feb 1905). Collected in G. K. Chesterton and Dale Ahlquist (ed. ), In Defense of Sanity: The Best Essays of G.K. Chesterton (2011), 87. Solar is now bankable. When solar was perceived as more risky it required a premium [and now it’s] becoming part of a much broader capital market. As quoted by Christopher Martin in 'Solar 15% Returns Lure Investments From Google to Buffett', Bloomberg business Week (20 Mar 2012). The quote was referenced by Steven Cho when outlining progress in clean energy, in his letter (1 Feb 2013) to Energy Department employees announcing his decision not to serve a second term. Standing now in diffused light, with the wind at my back, I experience suddenly a feeling of completeness–not a feeling of having achieved something or of being stronger than everyone who was ever here before, not a feeling of having arrived at the ultimate point, not a feeling of supremacy. Just a breath of happiness deep inside my mind and my breast. The summit seemed suddenly to me to be a refuge, and I had not expected to find any refuge up here. Looking at the steep, sharp ridges below us, I have the impression that to have come later would have been too late. Everything we now say to one another, we only say out of embarrassment. I don’t think anymore. As I pull the tape recorder, trancelike, from my rucksack, and switch it on wanting to record a few appropriate phrases, tears again well into my eyes. “Now we are on the summit of Everest,” I begin, “it is so cold that we cannot take photographs…” I cannot go on, I am immediately shaken with sobs. I can neither talk nor think, feeling only how this momentous experience changes everything. To reach only a few meters below the summit would have required the same amount of effort, the same anxiety and burden of sorrow, but a feeling like this, an eruption of feeling, is only possible on the summit itself. In Everest: Expedition to the Ultimate (1979), 180. That the great majority of those who leave school should have some idea of the kind of evidence required to substantiate given types of belief does not seem unreasonable. Nor is it absurd to expect that they should go forth with a lively interest in the ways in which knowledge is improved and a marked distaste for all conclusions reached in disharmony with the methods of scientific inquiry. 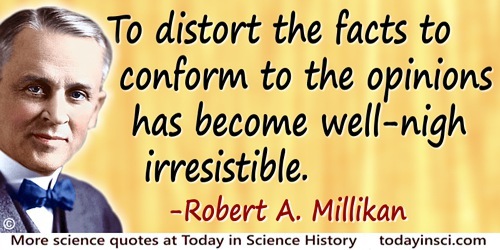 The ability of the genes to vary and, when they vary (mutate), to reproduce themselves in their new form, confers on these cell elements, as Muller has so convincingly pointed out, the properties of the building blocks required by the process of evolution. Thus, the cell, robbed of its noblest prerogative, was no longer the ultimate unit of life. This title was now conferred on the genes, subcellular elements, of which the cell nucleus contained many thousands and, more precisely, like Noah’s ark, two of each kind. Nucleo-cytoplasmic Relations in Micro-Organisms: Their Bearing on Cell Heredity and Differentiation (1953), 2-3. The advanced course in physics began with Rutherford’s lectures. I was the only woman student who attended them and the regulations required that women should sit by themselves in the front row. There had been a time when a chaperone was necessary but mercifully that day was past. At every lecture Rutherford would gaze at me pointedly, as I sat by myself under his very nose, and would begin in his stentorian voice: “Ladies and Gentlemen”. All the boys regularly greeted this witticism with thunderous applause, stamping with their feet in the traditional manner, and at every lecture I wished I could sink into the earth. To this day I instinctively take my place as far back as possible in a lecture room. In Cecilia Payne-Gaposchkin: An Autobiography and Other Recollections (1996), 118. The ancients devoted a lifetime to the study of arithmetic; it required days to extract a square root or to multiply two numbers together. Is there any harm in skipping all that, in letting the school boy learn multiplication sums, and in starting his more abstract reasoning at a more advanced point? Where would be the harm in letting the boy assume the truth of many propositions of the first four books of Euclid, letting him assume their truth partly by faith, partly by trial? Giving him the whole fifth book of Euclid by simple algebra? Letting him assume the sixth as axiomatic? Letting him, in fact, begin his severer studies where he is now in the habit of leaving off? We do much less orthodox things. Every here and there in one’s mathematical studies one makes exceedingly large assumptions, because the methodical study would be ridiculous even in the eyes of the most pedantic of teachers. I can imagine a whole year devoted to the philosophical study of many things that a student now takes in his stride without trouble. The present method of training the mind of a mathematical teacher causes it to strain at gnats and to swallow camels. Such gnats are most of the propositions of the sixth book of Euclid; propositions generally about incommensurables; the use of arithmetic in geometry; the parallelogram of forces, etc., decimals. In Teaching of Mathematics (1904), 12. The day when the scientist, no matter how devoted, may make significant progress alone and without material help is past. This fact is most self-evident in our work. 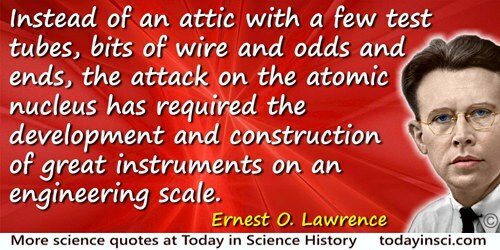 Instead of an attic with a few test tubes, bits of wire and odds and ends, the attack on the atomic nucleus has required the development and construction of great instruments on an engineering scale. The description of some of the experiments, which are communicated here, was completely worked out at my writing-table, before I had seen anything of the phenomena in question. After making the experiments on the following day, it was found that nothing in the description required to be altered. I do not mention this from feelings of pride, but in order to make clear the extraordinary ease and security with which the relations in question can be considered on the principles of Arrhenius' theory of free ions. Such facts speak more forcibly then any polemics for the value of this theory . Philosophical Magazine (1891), 32, 156. The essence of engineering consists not so much in the mere construction of the spectacular layouts or developments, but in the invention required—the analysis of the problem, the design, the solution by the mind which directs it all. As quoted, “he said to the writer in effect,” Robert Fletcher, 'William Hood '67, Chief Engineer of the Southern Pacific Railroad Lines, Dartmouth Alumni Magazine (1919), Vol. 11, 223. The great object of all knowledge is to enlarge and purify the soul, to fill the mind with noble contemplations, to furnish a refined pleasure, and to lead our feeble reason from the works of nature up to its great Author and Sustainer. Considering this as the ultimate end of science, no branch of it can surely claim precedence of Astronomy. No other science furnishes such a palpable embodiment of the abstractions which lie at the foundation of our intellectual system; the great ideas of time, and space, and extension, and magnitude, and number, and motion, and power. How grand the conception of the ages on ages required for several of the secular equations of the solar system; of distances from which the light of a fixed star would not reach us in twenty millions of years, of magnitudes compared with which the earth is but a foot-ball; of starry hosts—suns like our own—numberless as the sands on the shore; of worlds and systems shooting through the infinite spaces. Oration at Inauguration of the Dudley Astronomical Observatory, Albany (28 Jul 1856). Text published as The Uses of Astronomy (1856), 36. The love of experiment was very strong in him [Charles Darwin], and I can remember the way he would say, “I shan't be easy till I have tried it,” as if an outside force were driving him. He enjoyed experimenting much more than work which only entailed reasoning, and when he was engaged on one of his books which required argument and the marshalling of facts, he felt experimental work to be a rest or holiday. In Charles Darwin: His Life Told in an Autobiographical Chapter, and in a Selected Series of his Published Letters (1908), 95. The maintenance of security … required every member of the project to attend strictly to his own business. The result was an operation whose efficiency was without precedent. In And Now It Can Be Told: The Story Of The Manhattan Project (1962), 414. The more intelligence mankind bestows upon technology, the less knowledge a child is required to learn. If this pattern is never changed, the generation of the future may become reduced to nothing more than lifeless drones born for nothing except pushing buttons on a machine that lives the lives of their masters. THE OATH. I swear by Apollo [the healing God], the physician and Aesclepius [son of Apollo], and Health [Hygeia], and All-heal [Panacea], and all the gods and goddesses, that, according to my ability and judgment, I will keep this Oath and this stipulation—to reckon him who taught me this Art equally dear to me as my parents, to share my substance with him, and relieve his necessities if required; to look upon his offspring in the same footing as my own brothers, and to teach them this art, if they shall wish to learn it, without fee or stipulation; and that by precept, lecture, and every other mode of instruction, I will impart a knowledge of the Art to my own sons, and those of my teachers, and to disciples bound by a stipulation and oath according to the law of medicine, but to none others. I will follow that system of regimen which, according to my ability and judgment, I consider for the benefit of my patients, and abstain from whatever is deleterious and mischievous. I will give no deadly medicine to any one if asked, nor suggest any such counsel; and in like manner I will not give to a woman a pessary to produce abortion. With purity and with holiness I will pass my life and practice my Art. I will not cut persons laboring under the stone, but will leave this to be done by men who are practitioners of this work. Into whatever houses I enter, I will go into them for the benefit of the sick, and will abstain from every voluntary act of mischief and corruption; and, further, from the seduction of females or males, of freemen and slaves. Whatever, in connection with my professional practice or not, in connection with it, I see or hear, in the life of men, which ought not to be spoken of abroad, I will not divulge, as reckoning that all such should be kept secret. While I continue to keep this Oath unviolated, may it be granted to me to enjoy life and the practice of the art, respected by all men, in all times! But should I trespass and violate this Oath, may the reverse be my lot! The Genuine Works of Hippocrates, trans. Francis Adams (1886), Vol. 2, 344-5. The origin of a science is usually to be sought for not in any systematic treatise, but in the investigation and solution of some particular problem. This is especially the case in the ordinary history of the great improvements in any department of mathematical science. Some problem, mathematical or physical, is proposed, which is found to be insoluble by known methods. This condition of insolubility may arise from one of two causes: Either there exists no machinery powerful enough to effect the required reduction, or the workmen are not sufficiently expert to employ their tools in the performance of an entirely new piece of work. The problem proposed is, however, finally solved, and in its solution some new principle, or new application of old principles, is necessarily introduced. If a principle is brought to light it is soon found that in its application it is not necessarily limited to the particular question which occasioned its discovery, and it is then stated in an abstract form and applied to problems of gradually increasing generality. Other principles, similar in their nature, are added, and the original principle itself receives such modifications and extensions as are from time to time deemed necessary. The same is true of new applications of old principles; the application is first thought to be merely confined to a particular problem, but it is soon recognized that this problem is but one, and generally a very simple one, out of a large class, to which the same process of investigation and solution are applicable. The result in both of these cases is the same. A time comes when these several problems, solutions, and principles are grouped together and found to produce an entirely new and consistent method; a nomenclature and uniform system of notation is adopted, and the principles of the new method become entitled to rank as a distinct science. In A Treatise on Projections (1880), Introduction, xi. Published as United States Coast and Geodetic Survey, Treasury Department Document, No. 61. The physician himself, if sick, actually calls in another physician, knowing that he cannot reason correctly if required to judge his own condition while suffering. The problems of the infinite have challenged man’s mind and have fired his imagination as no other single problem in the history of thought. The infinite appears both strange and familiar, at times beyond our grasp, at times easy and natural to understand. In conquering it, man broke the fetters that bound him to earth. All his faculties were required for this conquest—his reasoning powers, his poetic fancy, his desire to know. With co-author James R Newman, in 'Beyond the Google', Mathematics and the Imagination (1940), 35. The product of mental labor—science—always stands far below its value, because the labor-time necessary to reproduce it has no relation at all to the labor-time required for its original production. The required techniques of effective reasoning are pretty formal, but as long as programming is done by people that don’t master them, the software crisis will remain with us and will be considered an incurable disease. And you know what incurable diseases do: they invite the quacks and charlatans in, who in this case take the form of Software Engineering gurus. The statistical method is required in the interpretation of figures which are at the mercy of numerous influences, and its object is to determine whether individual influences can be isolated and their effects measured. The essence of the method lies in the determination that we are really comparing like with like, and that we have not overlooked a relevant factor which is present in Group A and absent from Group B. The variability of human beings in their illnesses and in their reactions to them is a fundamental reason for the planned clinical trial and not against it. Principles of Medical Statistics (1971), 13. The vacuum-apparatus requires that its manipulators constantly handle considerable amounts of mercury. Mercury is a strong poison, particularly dangerous because of its liquid form and noticeable volatility even at room temperature. Its poisonous character has been rather lost sight of during the present generation. My co-workers and myself found from personal experience-confirmed on many sides when published—that protracted stay in an atmosphere charged with only 1/100 of the amount of mercury required for its saturation, sufficed to induce chronic mercury poisoning. This first reveals itself as an affection of the nerves, causing headaches, numbness, mental lassitude, depression, and loss of memory; such are very disturbing to one engaged in intellectual occupations. Hydrides of Boron and Silicon (1933), 203. The valuable properties of this cement depend in a great measure on the mode of preparing it for use. The mixing should therefore be conducted with care in order to form a perfect union of the powdered cement, sand and water. This can be best accomplished by the use of the New England corn hoe on a board floor or by beating with a hand stamper; not much labour is required if properly applied. Mechanics can judge when the mixture is perfect by the appearance of the mortar, which, when properly prepared, very much resembles putty. Directions for Using White's Patent Hydraulic Cement. The very closest stars would require many years to visit, even traveling at the speed of light, which is impossible according to Einstein's theory of relativity. Today's fastest spaceships would require 200,000 years to travel to Alpha Centauri, our closest bright star. The energy required to send a hundred colonists to another star, as Frank Drake has pointed out, would be enough to meet the energy needs of the entire United States over a human lifetime. And these estimates are regarding nearby stars. When we consider the distances across the entire galaxy, and between galaxies, interstellar travel seems absolutely untenable. As co-author with his son, Marshall Fisher, in Strangers in the Night: a Brief History of Life on Other Worlds (1998). The work of Planck and Einstein proved that light behaved as particles in some ways and that the ether therefore was not needed for light to travel through a vacuum. When this was done, the ether was no longer useful and it was dropped with a glad cry. The ether has never been required since. It does not exist now; in fact, it never existed. In Asimov on Physics (1976), 85. Also in Isaac Asimov’s Book of Science and Nature Quotations (1988), 212. There are many arts and sciences of which a miner should not be ignorant. First there is Philosophy, that he may discern the origin, cause, and nature of subterranean things; for then he will be able to dig out the veins easily and advantageously, and to obtain more abundant results from his mining. Secondly there is Medicine, that he may be able to look after his diggers and other workman ... Thirdly follows astronomy, that he may know the divisions of the heavens and from them judge the directions of the veins. Fourthly, there is the science of Surveying that he may be able to estimate how deep a shaft should be sunk … Fifthly, his knowledge of Arithmetical Science should be such that he may calculate the cost to be incurred in the machinery and the working of the mine. Sixthly, his learning must comprise Architecture, that he himself may construct the various machines and timber work required underground … Next, he must have knowledge of Drawing, that he can draw plans of his machinery. Lastly, there is the Law, especially that dealing with metals, that he may claim his own rights, that he may undertake the duty of giving others his opinion on legal matters, that he may not take another man’s property and so make trouble for himself, and that he may fulfil his obligations to others according to the law. In De Re Metallica (1556), trans. H.C. and L.H. Hoover (1950), 3-4. There is perhaps no science of which the development has been carried so far, which requires greater concentration and will power, and which by the abstract height of the qualities required tends more to separate one from daily life. In 'Provisional Report of the American Subcommittee of the International Commission on Teaching of Mathematics', Bulletin American Society (Nov 1910), 97. To produce any given motion, to spin a certain weight of cotton, or weave any quantity of linen, there is required steam; to produce the steam, fuel; and thus the price of fuel regulates effectively the cost of mechanical power. Abundance and cheapness of fuel are hence main ingredients in industrial success. It is for this reason that in England the active manufacturing districts mark, almost with geological accuracy, the limits of the coal fields. In The Industrial Resources of Ireland (1844), 2. To understand this for sense it is not required that a man should be a geometrician or a logician, but that he should be mad. In Thomas Hobbes and William Molesworth (ed. ), 'Considerations Upon the Answer of Doctor Wallis to the Three Papers of Mr. Hobbes', Leviathan: Or the Matter, Form and Power of a Commonwealth Ecclesiastical and Civil (1845), Vol. 7, 445. What Hobbes refers to as “this” is described as “that the volume generated by revolving the region under 1/x from 1 to infinity has finite volume,” in In Nicholas J. Rose Mathematical Maxims and Minims (1988). To work our railways, even to their present extent, there must be at least 5,000 locomotive engines; and supposing an engine with its tender to measure only 35 feet, it will be seen, that the whole number required to work our railway system would extend, in one straight line, over 30 miles, or the whole distance from London to Chatham. From 'Railway System and its Results' (Jan 1856) read to the Institution of Civil Engineers, reprinted in Samuel Smiles, Life of George Stephenson (1857), 512. Two managers decided they would go moose hunting. They shot a moose, and as they were about to drag the animal by the hind legs, a biologist and an engineer came along. The managers thanked the two and started dragging the moose by the antlers. In Jon Fripp, Michael Fripp and Deborah Fripp, Speaking of Science (2000), 193. Unconscious, perhaps, of the remote tendency of his own labours, he [Joseph Black] undermined that doctrine of material heat, which he seemed to support. For, by his advocacy of latent heat, he taught that its movements constantly battle, not only some of our senses, but all of them; and that, while our feelings make us believe that heat is lost, our intellect makes us believe that it is not lost. Here, we have apparent destructability, and real indestructibility. To assert that a body received heat without its temperature rising, was to make the understanding correct the touch, and defy its dictates. It was a bold and beautiful paradox, which required courage as well as insight to broach, and the reception of which marks an epoch in the human mind, because it was an immense step towards idealizing matter into force. History of Civilization in England (1861), Vol. 2, 494. We are faced today with a social decision resulting from our progress in molecular genetics at least equal to, and probably greater than, that required of us twenty years ago with the maturity of nuclear power. In 'Abstract' The Impurity of Science (19 Apr 1962), the printed version of the Robbins Lecture (27 Feb 1962) given at Pomona College, Claremont, California, as published by Ernest O. Lawrence Radiation Laboratory, University of California. We are not to suppose, that there is any violent exertion of power, such as is required in order to produce a great event in little time; in nature, we find no deficiency in respect of time, nor any limitation with regard to power. But time is not made to flow in vain; nor does there ever appear the exertion of superfluous power, or the manifestation of design, not calculated in wisdom to effect some general end. 'Theory of the Earth', Transactions of the Royal Society of Edinburgh, 1788, 1, 294. What is important is the gradual development of a theory, based on a careful analysis of the ... facts. ... Its first applications are necessarily to elementary problems where the result has never been in doubt and no theory is actually required. At this early stage the application serves to corroborate the theory. The next stage develops when the theory is applied to somewhat more complicated situations in which it may already lead to a certain extent beyond the obvious and familiar. Here theory and application corroborate each other mutually. Beyond lies the field of real success: genuine prediction by theory. It is well known that all mathematized sciences have gone through these successive stages of evolution. 'Formulation of the Economic Problem' in Theory of Games and Economic Behavior (1964), 8. Reprinted in John Von Neumann, F. Bródy (ed.) and Tibor Vámos (ed. ), The Neumann Compendium (2000), 416. What is peculiar and new to the [19th] century, differentiating it from all its predecessors, is its technology. It was not merely the introduction of some great isolated inventions. It is impossible not to feel that something more than that was involved. … The process of change was slow, unconscious, and unexpected. In the nineteeth century, the process became quick, conscious, and expected. … The whole change has arisen from the new scientific information. Science, conceived not so much in its principles as in its results, is an obvious storehouse of ideas for utilisation. … Also, it is a great mistake to think that the bare scientific idea is the required invention, so that it has only to be picked up and used. An intense period of imaginative design lies between. One element in the new method is just the discovery of how to set about bridging the gap between the scientific ideas, and the ultimate product. It is a process of disciplined attack upon one difficulty after another This discipline of knowledge applies beyond technology to pure science, and beyond science to general scholarship. It represents the change from amateurs to professionals. … But the full self-conscious realisation of the power of professionalism in knowledge in all its departments, and of the way to produce the professionals, and of the importance of knowledge to the advance of technology, and of the methods by which abstract knowledge can be connected with technology, and of the boundless possibilities of technological advance,—the realisation of all these things was first completely attained in the nineteeth century. In Science and the Modern World (1925, 1997), 96. When two people are under the influence of the most violent, most insane, most delusive, and most transient of passions, they are required to swear that they will remain in that exalted, abnormal, and exhausting condition continuously until death do them part. When [Humphry Davy] saw the minute globules of potassium burst through the crust of potash, and take fire as they entered the atmosphere, he could not contain his joy—he actually bounded about the room in ecstatic delight; some little time was required for him to compose himself to continue the experiment. Quoted in Memoirs of the Life of Sir Humphry Davy, in J. Davy (ed. ), The Collected Works of Sir Humphry Davy(1839-40), Vol 1, 109. Yet the widespread [planetary theories], advanced by Ptolemy and most other [astronomers], although consistent with the numerical [data], seemed likewise to present no small difficulty. For these theories were not adequate unless they also conceived certain equalizing circles, which made the planet appear to move at all times with uniform velocity neither on its deferent sphere nor about its own [epicycle's] center … Therefore, having become aware of these [defects], I often considered whether there could perhaps be found a more reasonable arrangement of circles, from which every apparent irregularity would be derived while everything in itself would move uniformly, as is required by the rule of perfect motion. From Nicholaus Copernicus, Edward Rosen (trans. ), Pawel Czartoryski (ed.) 'Commentariolus', in Nicholas Copernicus: Minor Works (1985), 81-83. Excerpted in Lisa M. Dolling, Arthur F. Gianelli and Glenn N. Statile (eds.) The Tests of Time: Readings in the Development of Physical Theory (2003), 40. [Ignorance] of the principle of conservation of energy … does not prevent inventors without background from continually putting forward perpetual motion machines… Also, such persons undoubtedly have their exact counterparts in the fields of art, finance, education, and all other departments of human activity… persons who are unwilling to take the time and to make the effort required to find what the known facts are before they become the champions of unsupported opinions—people who take sides first and look up facts afterward when the tendency to distort the facts to conform to the opinions has become well-nigh irresistible. From Evolution in Science and Religion (1927), 58-59. An excerpt from the book including this quote appears in 'New Truth and Old', Christian Education (Apr 1927), 10, No. 7, 394-395. [Napoleon] directed Bourrienne to leave all his letters unopened for three weeks, and then observed with satisfaction how large a part of the correspondence had thus disposed of itself, and no longer required an answer. Lecture, 'Napoleon', collected in Representative Men (1850), 177. … the reasoning process [employed in mathematics] is not different from that of any other branch of knowledge, … but there is required, and in a great degree, that attention of mind which is in some part necessary for the acquisition of all knowledge, and in this branch is indispensably necessary. This must be given in its fullest intensity; … the other elements especially characteristic of a mathematical mind are quickness in perceiving logical sequence, love of order, methodical arrangement and harmony, distinctness of conception. In Treatise on Infinitesimal Calculus (1868), Vol. 8, 6. In The Time Machine (1898), 6.